The levels are some of the best you will ever see. Each one is filled with exquisite detail, amazing architecture and textured like a pro. 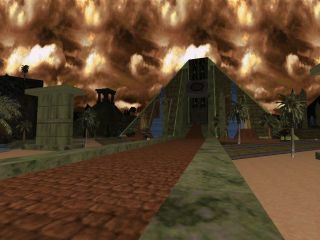 You'll start off at Duke's house, from which the rest of the episode continues in a more or less haphazard fashion - you'll visit a medieval castle, an enormous outdoor/hi-tech level and some terribly well-done caves, before meeting the boss in a surreal Egyptian-style level. 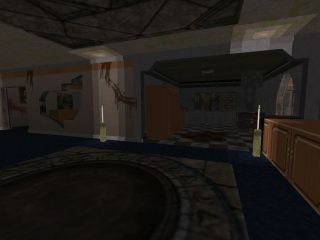 Every level is uniquely themed, huge and tremendously replayable, not only because the maps are fun to explore but because difficulty settings have been implemented. The new textures, sounds and background scores fit the levels well, nothing at all to fault there. 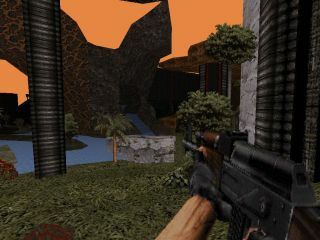 There's a couple of midi's pinched from UT but, despite Duke3D being a far better game, they still seem to suit Duke3D well. WGRealms has quickly risen to one of my all-time favourite mods. I was literally awestruck at the immensity and depth of these levels the first time through, and I eagerly await WGRealms 2. Unfortunately it'll only work with the Atomic Edition, so if you're a v1.3d'er life might suddenly seem rather pointless. Be sure to create a new, clean Duke directory to unzip WGRealms into - as it has not been GRP'd and may overwrite some of your more important files. Download, download, download! Description:  5 Level episode. All new textures. Level1 :AWAKENING:      : Dark scary walkthrough Level based inside a house. 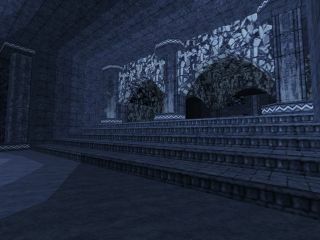 Level2 :MEDIEVIL CRESS: : Dark Scary Level based in a castle in the hills. Level3 :OPEN SEASON:    : Giant Nature Level massive frag fest hundreds of enimies. 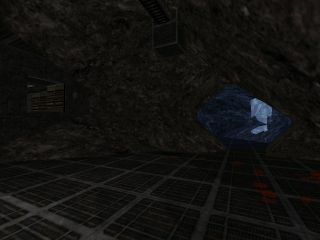 Level4 :CRYSTAL MINES:  : Cave system level. Level5 :TEMPLE CRESS:   : Huge Egyptian Boss level. Single Player         : YES! all 5 levels. DukeMatch Level       : YES! all 5 levels. hardst. If its to easy on hardst im sory. Co-Op Settings        : YES! all 5 levels. New textures? : YES! Episode uses all new Textures. New Midis? : YES! All new midis. New Weapons? : Yes! 2.
the best impact with this mode. very good in GL so try this to. James Stanfield : For beta testing and posting the texture thread in AMC. Gangster        : For the cool weapons and some of the plant sprites. Mrline          : For beta testing. Maartn          : For beta testing. Sang            : For beta testing. Stephano        : For beta testing. Alex Pistol     : For beta testing. Rusty Nails     : For beta testing. Highwaire       : For some art he gave me. Meth            : For beta testing. Quakis          : for some weapon editing I didnt use. review it and add it to your own sites. Page generated in 16.8184 seconds.